Domain Patterns in Enterprise Projects · JVM. Blog. If I had to separate projects I've been in, i would difference between data manipulation and enterprise projects. Data manipulation projects mainly consist of a set of forms needed to alter data which is stored in some persistent store (most of the time a relational database). In these projects, there is not much domain logic to be found. 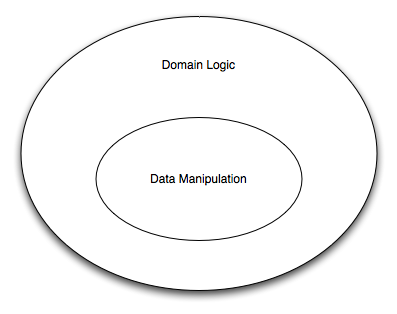 There might be some validation logic, some jobs running in the background, but that's mainly it with domain logic. Enterprise projects are all about domain logic and integration of external systems. Most of the time a project starts with implementing all the views and domain classes which are considered to be simple, that is, not much domain knowledge has to be available in order to implement those views. But as time goes by, domain logic creeps in and classes which seemed pretty small and granular for data manipulation style grow to be oversized monsters. Web frameworks like Grails make it easy to implement data manipulation style applications: if project members have a clear picture how to model the domain classes, they write the domain classes and all the view and controller stuff comes automatically with it. If your project is moving towards being an enterprise project, there are some patterns that helped in my projects to deal with additional domain logic and complexity i want to share with this article. or the Builder pattern . Well-defined creation procedures/constructors/factory methods/etc. are great, because there is a predefined way on how to create a fully initialized, valid object. If we should write an integration test for the Customer class and wanted some customer test instances, we would need to know what it takes to create a "valid" customer object - it might be simple in this case, but with more complex classes programmers could simply give up to write test-cases based on the simple fact that it is not obvious to them who to create instances of some type. After 30 days, if the customer is in state REGISTERED, the application needs to send an e-mail to the customer, telling that the test-period ends in 5 days. Keep in mind that there is no single best way on how to treat domain logic in enterprise applications, but one should at least know some basic patterns found in  or . Embedding classes has the advantage that developers don't have to care about cascading CRUD operations, since data is directly embedded in the parent table at the database level. Therefore, value object classes simplify domain class relationships. To be honest, outsourcing data accessing logic in a separate repository class does not seem to be reasonable with GORM. At least one use case would justify separate repository classes: complex data graph deletion. If the domain model has complex relationships the best strategy is to define Aggregate objects. An aggregate object is the root object of a graph of associated objects. Clients of that class access objects in the aggregates graph only through accessor methods in the aggregate object. It is not possible to modify objects in the data graph directly without using aggregate methods. This pattern simplifies relationships within the domain model and therefore reduces complexity to handle the object graphs and relationships between them. Overall, modification/deletion operations are hidden and encapsulated by the root entity of the aggregate. This article does not claim to offer a complete overview of best practices in Grails enterprise projects, but reflects best-practices that i have found useful in projects i participated in. I would be happy to discuss other views or other patterns in the comments section of this article.